With the amount of invasion of privacies that are happening these days (especially in the lives of public figures), you can never be too safe when it comes to safeguarding your privacy, even when you are using the computer. After all, many of us are living out the connected lifestyle these days, and we tend to log in and connect from different locations throughout each moment, using different computers and networks as well. 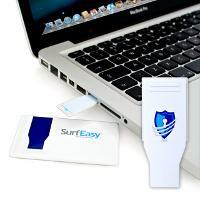 With the £59.99 SurfEasy USB device, it will help in the area of security by offering you a personalized browsing experience regardless of where you are. Relying on an extremely speedy and super-secure SSL encryption that most major banking institutions would, SurfEasy strives to make sure your status updates remain as your own, and your banking transactions are private, so that no prying or curious eyes will be able to figure out your secrets. The SurfEasy will also ensure that you do not leave digital cookie crumbs behind for others to trace your coming and going.